The E*TRADE Developer Platform uses the OAuth authorization protocol, version 1.0a. OAuth enables an authenticated user to authorize limited access to their account by third-party applications, without exposing user credentials or other sensitive information. This document provides a brief summary of OAuth and describes how it is used in our developer platform. We recommend that developers be familiar with the detailed OAuth information at: http://oauth.net/core/1.0a/. A core principle of OAuth is that the service provider can authenticate both the user and the consumer. This provides a secure basis for the user to authorize the consumer for limited access to the user's account on the service provider. The service provider authenticates the consumer. The service provider authenticates the user. The user authorizes the consumer for limited access to the user's account on the service provider. The application uses its own credentials to acquire a temporary request token from E*TRADE by calling the Get Request Token API. Using the Authorize Application API, the application redirects the user, along with the request token, to E*TRADE. 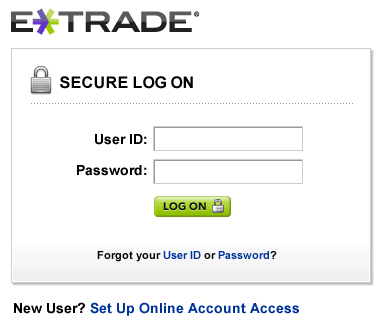 There the user logs in to E*TRADE and grants the application limited access to the user's account. 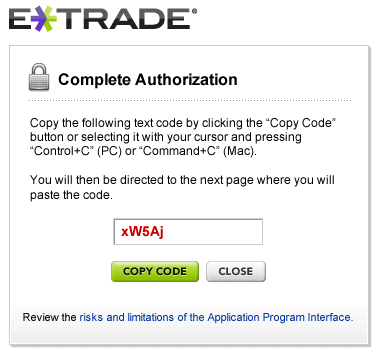 E*TRADE generates a verification code, which is passed to the application (manually by the user, or automatically via a callback). The application uses the verification code to acquire an access token that grants temporary access to that user's account. This is done with the Get Access Token API. The access token is included with all requests to the E*TRADE API, identifying the user and authorizing the application. By default, the token expires at midnight US Eastern time. At that time, the token may be renewed with the Renew Access Token API. When the application terminates or is finished with the token, we recommend that you revoke the token with the Revoke Access Token API. Using a callback requires that the callback URL be associated with your consumer key in the E*TRADE system. To request this, log in to your E*TRADE account and send a secure message to Customer Service. Select the subject "Technical Issues" and the topic "E*TRADE API". State that you would like to have a callback configured, and specify your consumer key and the desired callback URL. Your callback URL can be just a simple address, or can also include query parameters. The oauth_callback_confirmed property of the request_token API returns TRUE to show that there is a callback URL associated with the consumer key. Users who approve the authorization request are automatically redirected to the callback URL, with the verification code appended as a query parameter (as shown in the example URLs above). Once logged in, the user is presented with a request to authorize the application to access the account, as shown below. The name of the application is displayed (based on the consumer key that was passed to the login page) along with the list of privileges that will be granted - e.g., submit and review orders, retrieve account information, and retrieve market data. 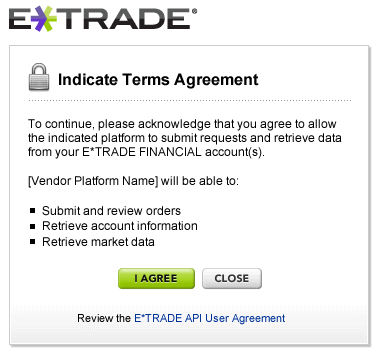 If the user agrees to the request, E*TRADE generates a verification code that refers to this agreement. If a callback URL is associated with the consumer key, the browser is automatically redirected to that URL, with the verification key included as a URL parameter. If not, the user sees a page that displays the verification code, as shown below, and the user has to manually copy the code and paste it into a field in the application. At that point, the application can send a request to E*TRADE for an access token, attaching the consumer key, the verification code, and an appropriate signature based on the application's consumer secret. The access token grants limited access to the user account for a fixed period of time, and must be attached to all API requests as described below. Once the application has acquired OAuth credentials, as described above, they must be attached to all API requests. oauth_nonce string Required A nonce, as described in OAuth 1.0a documentation - roughly, an arbitrary or random value that cannot be used again with the same timestamp. oauth_signature_method string Required The signature method used by the consumer to sign the request. The only supported option is HMAC-SHA1. oauth_token string Required The consumer’s access token issued by the service provider. A timestamp must accompany every REST request, stating the date and time of the request in epoch time (i.e., the number of seconds since 12:00:00 a.m. January 1, 1970 UTC). When the request is received at E*TRADE, the timestamp must be within five minutes of the current UTC time. Every request must include a nonce - an arbitrary or random value, used to ensure that each request is unique. The same nonce can be used for multiple requests, as long as those requests do not have the same timestamp. A typical solution is to generate a random hash for each request. The application must include a signature as specified in the OAuth documentation at http://oauth.net/core/1.0a/. The only supported OAuth version is 1.0a, and the only supported hash method is HMAC-SHA1. For compatibility purposes, we recommend using the libraries provided at http://oauth.net. Note that most of the OAuth examples in this documentation are visually correct but mathematically invalid - i.e., they may not contain values that can be used for testing a signature algorithm. If you wish to test your signature algorithm, use the following table. Given the provided input values, your code should produce the same resulting signature. Based on this information, your requests should contain the values shown below, although the variables may be in a different sequence. Authorization: OAuth oauth_consumer_key="282683cc9e4b8fc81dea6bc687d46758",oauth_timestamp="1273254425", oauth_nonce="LTg2ODUzOTQ5MTEzMTY3MzQwMzE%3D",oauth_signature_method="HMAC-SHA1", oauth_signature="FjoSQaFDKEDK1FJazlY3xArNflk%3D",oauth_token="FiQRgQCRGPo7Xdk6G8QDSEzX0Jsy6sKN14cULcDavAGgU"
As an alternative, the OAuth information can be included as URL parameters. This is usually less desirable, because it creates a long query string and tends to mix API parameters with OAuth parameters. Below is an example of such a query string, for a query that would otherwise have been very eimple. Note that the E*TRADE API does not recognize OAuth credentials in the body of the HTTP request. The only supported options are the header or the query string. Get Request Token Returns a request token that can be used to initiate authorization. Authorize Application Using the request token, redirects the user to the E*TRADE authorization page, where the user authorizes the consumer application to access the account. This returns a verification code. Renew Access Token Renews the access token when it expires. Revoke Access Token Revokes the access token at the end of the session. Each of these APIs is documented separately in detail.